The Aragon City Council skipped over most of their agenda without any action taken during their October session. Council members Debbie Pittman and Candace Seiz listened to an explanation of a new driving policy provided by Public Works Superintendent Daniel Johnson, who drafted it during their October work session. No action was taken during Thursday's Aragon City Council meeting on a number of issues that were placed on the agenda by Council Member Candace Seiz that sought to give herself and fellow members greater inclusion in decision-making at city hall. Seiz cried "denied" after Mayor Garry Baldwin brought up each issue in the council's Thursday night meeting and they were left without motions or discussion, but a late addition to the agenda got a vote of approval to move ahead with a special work session to discuss a change to the city's charter and form of government. That unanimous decision came once the nine different items previously untouched. have read and understood the guidelines the city has in place. Seiz also sought to enact a policy to give Financial Consultant Rick Hartley additional purview over spending, requiring that he or anyone who would take his place sign off on any purchases before they are made to ensure funds are available to cover the cost. She also wanted to enact a new rule that any employee who gives out their login information for city computer systems would face potential termination for doing so. All those items were discussed during the second half of a nearly two-hour long work session that included a recess while officials waited for City Attorney Zach Burkhalter to arrive and provide his legal opinion on the items she wanted further discussion. Once he did arrive, Seiz stated that much of the work he generated for council members to review at a cost to the city matched what she already completed on her own, and Baldwin sought for Burkhalter to complete an additional legal opinion Seiz said she already felt she understood when it came to their ability to enact policies. Her questions about the charter were being left for the work session approved for a date and time to be determined. City Clerk Christie Langston said on Friday before press time that it was still in the planning stages, and further information would be forthcoming. Baldwin suggested the council come together and work out a plan for how they want to move forward before having to present a change to the charter and form of government for Aragon to State Rep. Trey Kelley and State Sen. Bill Heath to get approval in the state legislature from both chambers, and then onward to the signature of the next governor. Seiz said she did much that research on the Georgia Municipal Association's website, and that she recommended to the other council members they go with a new form of government that gives the council greater control over administrative duties in local government, and has a weak mayor instead of one that is responsible for everything. Council member Judd Fee agreed that "it would be nice to go with something like Rockmart has, because they have a strong council and a weak mayor. But they've also got enough budget to have a city manager. Maybe some day we could too. It'd be nice to have something in place like that so the burden falls on all five, and not just one." Burkhalter also offered to do additional research on the different forms of government, but didn't want to do so without approval since it would take time and cost Aragon in additional attorney's fees. In September alone, the city paid Burkhalter a fee of $1,712.35 for legal services. Before Burkhalter arrived, Baldwin sought to provide a response to some of what Seiz sought discussion on by providing the council with a copy of a new written policy he'd already signed and handed out to employees. Now unless the council directly approves, no employee shall be able to take home a city-owned vehicle if they live more than 25 miles away from Aragon's limits. Baldwin said he enacted the policy that day based on what he handed out to the council. Anyone who does have to drive more than 25 miles for anything other than work-related business would have to get permission from both the Mayor and Council before they do so. If they fail to get that permission and drive further than the 25 miles allowed, the mileage could result in punishment for the offense that includes the potential for losing their jobs. "I signed it today and it went into effect," Baldwin said during their October work session. He did say that one of the two officers left in the ranks of the Aragon Police Department lives – at least according to Google Maps – 31.2 miles from the City of Aragon, as opposed to the 25 miles allowed. He said the officer in question did say that in actual driving distance on a route usually taken, it was closer to 26 miles from the city limits to home. Baldwin wanted permission for the employee to continue using a take-home vehicle despite the small amount of mileage over what council members sought to enact. He also added that it was a verbal policy prior it being put down on paper. It was put to paper to avoid the previous issues brought forth when interim Police Chief Alison Taulbee drove back and forth between the Blue Ridge area to Aragon daily for work using a citysupplied police cruiser. Taulbee remains on administrative leave with pay for the next few weeks while an investigation continues, but if it continues past another two weeks the council decided in a final vote of their October meeting to move Taulbee's status to administrative leave without pay. The driving policy was crafted by Public Works Superintendent Daniel Johnson, who fielded questions about whether the vehicles would only be allowed to travel back within the city and to an employee's home only. Seiz was concerned the policy might contain a loophole to be exploited later. Johnson said he did include a specific language on the use of 'work-related use' into the policy to avoid employees using vehicles to go to a second job, or to use it for personal reasons like running errands in nearby communities. Seiz did see the language after a second reading and apologized for questioning it. Baldwin did get permission to allow for council approval for the time being of how they'll be notified and involved if an employee needs to go further than 25 miles for any reason, and they settled on individual discussion with Langston if necessary to make a decision. "We're trying to lure these people from other places to work for us, and under those circumstances we might have to deviate a little from the policy," Baldwin said. Seiz replied that "I just want to make sure the council is involved." Inconsistent distances in the past and not being written down have changed in the past, and now have set in stone. Seiz also sought to try and have the policy voted on by the council itself, but Baldwin said that "it's not a ordinance, it's not a resolution. It's mine. I've already signed it and imposed it, and distributed it to the employees." "I want to discuss that more once Zach (Burkhalter) arrives," Seiz said while they addressed the policy. "I want to make sure we're doing it right." Baldwin said "Ok. I'm good," before Seiz finished, and then asked him to stop and said "please don't interrupt me" as she continued. "It is very rude and unprofessional and I feel like you do that every time I say something you don't want to hear," she added. "All I'm saying is that I'm sure we're covered and following the correct process based on our current charter. So if I'm misinformed, since I've done my research, I'd like to know it. If I'm not misinformed, then we need to vote on this. It's not that we're disagreeing with you, we just need to follow the correct protocol." Burkhalter was requested by Baldwin after his arrival and discussion of the policy began to generate a written legal opinion about whether the council would need to vote on such an item or whether it would be left in place without any further approval needed. "I want to emphasize that we're wasting our taxpayer's money to pay our attorney to do research that has already been done and should have already been done," Seiz said the following day. A change in how student learning is evaluated locally is starting this year with Polk School District's inclusion in a new pilot program that looks to phase out the Georgia Milestones standardized test. Instead, they're joining nine other districts in the state who are moving to the Georgia MAP Assessment and PSD is now part of a partnership in a pilot program and joins Barrow County School System, Clayton County Public Schools, Floyd County Schools, Jackson County Schools, Jasper County Charter System, and Marietta City Schools. Superintendent Laurie Atkins said the program is moving ahead and they're only waiting for further U.S. Department of Education approval to fully implement it across all subjects. If the Georgia MAP Assessment Partnership is chosen, the ten districts listed above will begin the pilot assessment with a gradual phase-out of the Georgia Milestones Assessment Program by 2020. "Polk School District is excited to be a part of this innovative pilot. Our elementary and middle schools are already using MAP as our benchmark assessment program," Atkins said in a press release last week. "These benchmark assessments allow our educators to focus on individual needs for our students in a timely manner. Currently the state-mandated tests, which are administered in April and May, do not provide us with the information we need until the next school year." The problem isn't testing students to see where their academic progress lies. The real issue school officials have with the Georgia Milestones is the lag in results. So for instance, if Student A is retaining the information they are receiving in all of their subjects without showing any signs in testing of academic struggles, school officials know that student is making annual progress with their grade level. When however Student B lags behind in a subject like mathematics, educators under the Georgia Milestones testing protocols are not fully seeing the depth of their pupils lack of progress until after they have already moved up to the next grade level and are out of their classroom, and have an even harder time catching up with the rest of their pupils. "MAP allows our teachers to have instant feedback to adjust, adapt, and realign lessons for our students, as well as have more insight into the success of their instruction," Atkins said. "MAP, as opposed to Georgia Milestones, affords our students more opportunities to prove their mastery of the content throughout the school year instead of waiting until April and May." The MAP benchmark tests are administered three times a year; August, January, and May, with each benchmark test taking approximately one hour, as opposed to an entire week lost to the Georgia Milestones Assessment Program in the spring, and additional class time taken up in the months leading up to the standardized test to give students opportunity to prepare for some of the questions they'll face. Fixing this problem is a top priority for Polk School District, who this year begins the pilot program with a dual-testing procedure. Students will still take the Georgia Milestones assessment this spring, but they'll also be phasing in the new Georgia MAP assessment in mathematics first, then additional subjects will be included once approval from Federal officials gives the pilot program a green light. For the pilot, the GMAP will partner with nonprofit organization named NWEA, who will provide the Measure of Academic Progress Test (MAP) in order to create a single assessment system that uses adaptive assessments administered in fall, winter, and spring to yield growth data, instructionally relevant insights, and proficiency scores. "We applaud the Georgia state board of education for taking advantage of the opportunities for innovative assessments that ESSA has provided, and the district leaders for working together to make assessments better for students," said Chris Minnich, CEO, NWEA in last week's press release on the new testing policy. "We look forward to partnering to create an innovative solution that supports high quality educational decisions, meets accessibility standards, and fulfills accountability requirements." The scariest day of the year is nearing, and Polk County is becoming the place to go for frights and sweets. Between trunk-or-treats, corn mazes, fall festivals, costume contests, and other Halloween inspired events, locals are sure to get their fill of the spookiest holiday around. Before getting into the bulk of the forthcoming spooky events this coming weekend and through next Wednesday, a few helpful reminders and tips for people who planning to Trick-or-Treat this year. First, remember that during the evening hours that all who are out (including little ghouls and goblins wandering from house to house) should always wear reflective clothing, and an adult should be with their children at all times, if possible. Additionally, local officials ask that everyone slow down and drive safely on Halloween night to avoid both traffic violations and the potential to hurt people wandering about before the witching hour strikes. For youth, only ever take candy that is pre-packaged as a precaution against any potential threats that may have been inserted within. Hocus Pocus lunchtime screening: As part of the Halloween Hoopla, the Chamber has teamed up with H&R Block for several events including a lunchtime screening on Thursday of "Hocus Pocus" at Georgia Northwestern Technical College's Rockmart campus. Dress up and bring friends along for the event starting at 11 a.m. to screen the 1990's hit "Hocus Pocus" in the college's auditorium. Slime Time Kitchen: Youth will have one more chance before their big night of trick or treating to get in one more afternoon of sugar-filled fun when the Chamber office in Cedartown hosts Slime Time Kitchen. The Friday event is $5 per child, with all the materials provided to make a Jellobased edible slime cake, or a marshmallow slime cake. Festival of Treats: One recurring Halloween tradition is Rockmart's annual Festival of Treats which beckons citizens downtown for candy, kids costume contests, pet costume contests, face painting, and much more. Citizens can head downtown on October 31 from 4:30 through 6:30 p.m. for everything Halloween. The festival is completely free and everyone from vampires to princesses are encouraged to attend. Cedartown Trick or Treating: Cedartown is once again invit ing the county's ghosts and ghouls to the city's downtown area on Halloween day from 3:30 to 5:30 p.m. where businesses and locals will be handing out candy. Don't let your child leave with his or her treats too early because there will be a costume contest and a pet costume contest shortly after. Carlton Corn Maze: October is also when Carlton Farm unveils their annual corn maze. While not haunted this year, navigating the maze through chilly fall weather fits the holiday just as well. Those itching to test their navigation skills can show up at the farm at 1276 Cartersville Hwy, Rockmart. Tickets to the maze usually run from $5 to $7 depending on date and time. Monster Dash: Antioch Baptist Church, located at 609 S. Main St., presents the 2018 Monster Dash on Oct. 27 beginning at 4 p.m. The 5k run, or walk, encourages participants to dress in family-friendly costumes, and awards will be given for the top placers. Those interested can register on-site at 3:15 for $25. All funds raised will help the church's youth attend a Christian winter conference. Community Fall Festival: Second Baptist of Cedartown is continuing its annual fall festival on Oct. 28 from 6 through 8 p.m. at their home of 152 Evergreen lane. The free event promises a chili cook-off, bounce houses, a trunk-or-treat, and a silent auction to raise money for Operation Christmas Child. Costumes are asked to be kept mild and family friendly. Police Department Trunk-or-Treat: The Polk County Police Department is offering a safe way to collect candy with its second annual trunkor-treat on Halloween day beginning at 5:30 p.m. Those interested need only show up at Cedartown's 73 Clines Ingram Jackson Rd. Church Trunk-or-Treat: Anna Kresge United Methodist is also planning to offer candy with their Oct. 28 trunk-or-treat. Those interested need only show up to 15 Booger Hollow Rd. between 5 and 7 p.m. They aren't the only ones. First Baptist Church of Cedartown is hosting their Trunk-or-Treat on Halloween, Second Baptist Church is holding one during their Oct. 28 event, and many more. Check the community calendar for more. Pine Bower Fall Festival: Pine Bower Baptist Church has scheduled their annual Fall Festival and Chili Cook-Off for Saturday, Oct. 27 beginning at 5 p.m. Chili judging is set to begin at 5 p.m., and there will be carnival games, a cake walk, hay rides, a trunk-or-treat, and much more for those not interested in competing. Family Fun Day: Come out for a day of live music, games, food, hay rides, and fellowship at the Saturday, Oct. 27 Family Fun Day starting at 10 a.m. The Gospel Music Park is hosting the event at 1351 County Rd. 31, and everything is free. Sleepy Hollow Wedding Shoot: A wedding shoot themed after Washington Irving's 'The Legend of Sleepy Hollow' is being held at Hightower Falls, 771 Hightower Falls Road, Cedartown, and those interested in the November 7 event can get tickets for $55. Checkin begins at 1:30 p.m. and shooting begins at 2 p.m.
Editor Kevin Myrick and SJ Correspondent Sean Williams contributed to this report. The lights will soon be on again at West Cinema Theater in downtown Cedartown as a remodeling project wraps up in the weeks to come for a planned early November opening. A whole new concession area with digital signage is waiting to greet patrons to the completely remodeled West Cinema Theater in downtown Cedartown. 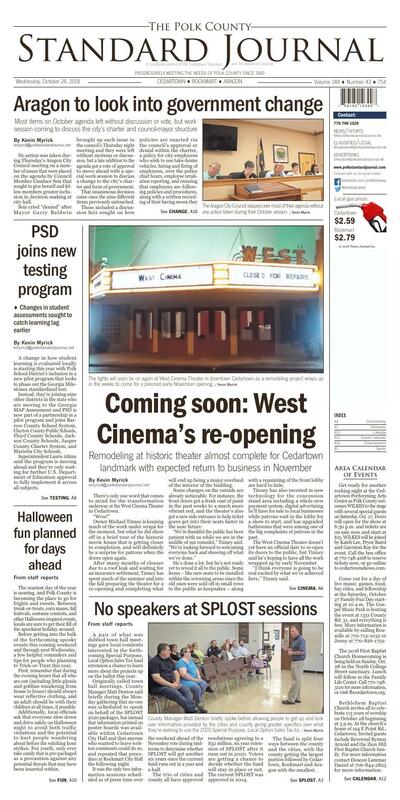 There's only one word that comes to mind for the transformation underway at the West Cinema Theater in Cedartown. Owner Michael Tinney is keeping much of the work under wraps for the moment, but what he did show off in a brief tour of the historic movie house that is getting closer to completion, and will definitely be a surprise for patrons when the doors open again. After many months of closure due to a roof leak and waiting for an insurance settlement, Tinney has spent much of the summer and into the fall preparing the theater for a re-opening and completing what will end up being a major overhaul of the interior of the building. Some changes on the outside are already noticeable. For instance, the front doors got a fresh coat of paint in the past weeks to a much more vibrant red, and the theater's also got a new side entrance to help ticket goers get into their seats faster in the near future. "We're thankful the public has been patient with us while we are in the middle of our remodel," Tinney said. "We're looking forward to welcoming everyone back and showing off what we've done." He's done a lot, but he's not ready yet to reveal it all to the public. Some items – like new seats to be installed within the screening areas since the old ones were sold off in small rows to the public as keepsakes – along with a repainting of the front lobby are hard to hide. Tinney has also invested in new technology for the concession stand area including a whole new payment system, digital advertising he'll have for sale to local businesses while patrons wait in the lobby for a show to start, and has upgraded bathrooms that were among one of the big complaints of patrons in the past. The West Cinema Theater doesn't yet have an official date to re-open its doors to the public, but Tinney said he's hoping to have all the work wrapped up by early November. "I think everyone is going to be real excited by what we've achieved here," Tinney said. The historic theater first opened its doors in 1941 and greeted patrons with a screening of "Three Sons o' Gun," a western starring Wayne Morris, Majorie Rambeau and Irene Rich, among others. The family-owned theater kept their original projectors running through the 1980s, when the Browning's who previously owned the business split the screening area in two, and closed off the upper balcony. In the years proceeding, upgrades in technology and in expectations from moviegoers have included the addition of 3D films, surround sound and many other advancements for the screening areas before the family sold the business in 2017. Tinney's same commitment to the historic theater he made when he purchased the business last remains steadfast, and when the public purchases their tickets from the box office in weeks to come and steps inside, he hopes everyone has the same reaction. "I hope they all say 'wow!'" Tinney said. County Manager Matt Denton briefly spoke before allowing people to get up and look over information provided by the cities and county giving greater specifics over what they're seeking to use the 2020 Special Purpose, Local Option Sales Tax for. Officials mingled with residents who looked over what is being presented to the public for the 2020 Special Purpose, Local Option Sales Tax fund during a Rockmart session. A pair of what was dubbed town hall meetings gave local residents interested in the forthcoming Special Purpose, Local Option Sales Tax fund extension a chance to learn more about the projects up on the ballot this year. Originally called town hall meetings, County Manager Matt Denton said briefly during the Monday gathering that no one was scheduled to speak on behalf of the SPLOST 2020 packages, but instead that information printed on poster boards was available within Cedartown City Hall and that anyone who wanted to leave written comments could do so, and repeated that procedure at Rockmart City Hall the following night. It was the only two information sessions scheduled as of press time over the weekend ahead of the November vote during midterms to determine whether SPLOST will get another six years once the current fund runs out in a year and a half. The trio of cities and county all have approved resolutions agreeing to a $32 million, six year extension of SPLOST after it runs out in 2020. Voters are getting a chance to decide whether the fund will stay in place or not. The current SPLOST was approved in 2014. The fund is split four ways between the county and the cities, with the county getting the largest portion followed by Cedartown, Rockmart and Aragon with the smallest. Revenues from an extension of the one-cent sales tax in 2020 seek to generate $17,190,400, or 53.72 percent of the total amount being sought would go to the county. The fund also seeks to generate $7,948,800 or 24.84 percent for the City of Cedartown, who wants to use the money for recreation and parks improvements, municipal infrastructure improvements, municipal equipment a2nd vehicles, technology infrastructure and improvements, public land, building and facilities improvements and municipal debt service. If approved, Rockmart will receive 20.03 percent of the fund or $6,409,600 of the money being sought. The city looks to use their portion of the 2020 SPLOST for municipal infrastructure improvements to water, sewer, collection and distribution systems, municipal buildings, facilities and public use or recreation area improvements, for public safety facilities and equipment improvements, transportation and pedestrian infrastructure improvements and for downtown and small business corridor development and improvements. The City of Aragon's portion of the 2020 SPLOST is the smallest and only makes up 1.41 percent of the fund according to the county's resolution approved in early August. The $451,200 approved for Aragon will seek to use the money for Public Safety and Public Works equipment, along with municipal infrastructure and technology improvements. The one-penny sales tax would extend the fund through 2026 after it runs out in June 2020, at the end of the FY 2020 fiscal year. Get ready for another rocking night at the Cedartown Performing Arts Center as Polk County welcomes WILKES to the stage with several special guests on Saturday, Oct. 27. Doors will open for the show at 6:30 p.m. and tickets are on sale now and start at $15. WILKES will be joined by Kaleb Lee, Pryor Baird and Garrison Ray for the event. Call the box office at 770-748-4168 to reserve tickets now, or go online to cedartownshows.com. Come out for a day of live music, games, food, hay rides, and fellowship at the Saturday, October 27 Family Fun Day starting at 10 a.m. The Gospel Music Park is hosting the event at 1351 County Rd. 31, and everything is free. More information is available by calling Rouzelle at 770-712-1032 or Jenny at 770-826-1759. The 2018 First Baptist Church Homecoming is being held on Sunday, Oct. 28 in the North College Street sanctuary. Lunch will follow in the Family Life Center. Call 770-748-3120 for more information, or visit fbccedartown.org. Bethlehem Baptist Church invites all to celebrate 113 years of worship on October 28 beginning at 3 p.m. At the church's home of 194 E Point Rd., Cedartown. Invited guests include Reverend Rymon Arnold and the Zion Hill First Baptist Church family. For more information contact Deacon Lammar Daniel at 706-844-2825 for more information. The Second Baptist Church of Cedartown is holding their annual Fall Festival on Sunday, Oct. 28 starting at 6 p.m. The event at the church includes a chili cook-off, bounce houses for youth, a trunk or treat and a silent auction, all being done to help raise money for the church's inclusion in "Operation Christmas Child." Activities and food are free. Dress up youth in a "not so scary" costume for a contest with different age categories. Visit sbcedartown.org or call 770-748-5252 for more information. The Polk County Police Department is hosting their annual Trunk-or-Treat on Wednesday, Oct. 31 at 5:30 p.m. at the PCPD headquarters, located at 73 Cline Ingram Jackson Drive, Cedartown. The event is for youth 13 and under. Anyone who enjoys local history will want to come listen to Georgia author Lisa Russell discuss her newest book entitled "Underwater Ghost Towns of North Georgia." This talk centers on the history of North Georgia's man-made lakes and the towns that were displaced to create them. Russell will be at the Rockmart Library on Tuesday October 30 from 5 to 6 p.m.
Halloween fun is coming to Cedartown and Rockmart on Wednesday, Oct. 31. The Downtown Cedartown Trick or Treat goes from 3:30 to 5:30 p.m., with a costume contest to follow featuring children 12 and under in Holloway Park, and the dog costume contest to follow. Rockmart's annual Festival of Treat's in downtown Rockmart kicks off at 4:30 p.m. to wrap up at 6:30 p.m., with a costume contest at 5:30 p.m. and the pet costume contest at 6 p.m.
Join the First Baptist Church of Cedartown for Halloween fun with their Trunk-R-Treat event being held on Wednesday, Oct. 31 at 5:30 p.m. in the church's parking lot. Call 770-748-3120 for more information, or visit fbccedartown.org. The Stocks family are organizing their annual holiday meal for the community coming up on Saturday, November 17 at the Nathan Dean Community Center on Goodyear Avenue in Rockmart. The event includes a meal, a coat drive and much more. Donations to help with the meal or of toys to give to local youth in need are welcome and appreciated. Those interested in helping out can contact Stocks at 678-719-1981. The American Legion in Rockmart is hosting their monthly all-you-caneat spaghetti dinner on Wednesday, Nov. 14. Meal of spaghetti, meatballs, garlic toast and salad, $5. Join the group for a good meal and to support veteran and children's programs. The Legion is located at 1 Veterans Circle, Rockmart. Rockmart Presbyterian Church is pleased to announce the expansion of its Music Ministry. First welcome Paul Campbell BM, MM, BD as Music Director and Organist, second the New Allen Organ in the Chancel and third, new program opportunities. The adult choir is accepting new members in preparation for its Christmas Eve program featuring "Christus Natus Est" by Cecilia McDonald. Sectional rehearsal are scheduled through the week. A new children's program includes Children's Choir on Wednesdays at 4 p.m. (FREE and open to all who wish their children to learn to sing). There will be an orientation meeting for parents and children on October 10 at 4 p.m. In addition to directing the new children's choir, Mr. Campbell will be offering Piano Lessons along with Shellee Wilson BM, BA, ME, will be offering singing/vocal lessons. Private lessons have a monthly fee. For information to joining our music program please stop in and see Paul Campbell at Rockmart Presbyterian or call him at: 404-312-7801. Cedar Christian School is accepting students for enrollment for the start of classes this fall. Those interested in Christ-focused education for their youth can contact them at 678-901-3500, e-mail CCS@sda1844.org, or visit the Cedar Christian School Facebook page. The school located at 625 West Ave., Cedartown. Members are invited to join the Cedartown Exchange Club weekly on Thursdays at 6 p.m. at the Cherokee Country Club for meetings and dinner. New members from across Polk County are encouraged to get involved by contacting club presidentelect Edward Guzman at 770-546-2482 to take part in the organization that is involved in a wide range of community projects. Visit their website at cedartownexchangeclub.com to learn more. Annual dues are required to be a member. The Ferst Readers Community Action Team meets the first Monday of the month at 5 p.m., alternately in Cedartown and Rockmart. Call 404-862-1273 for the meeting location. Find out more about how to help improve childhood literacy in Polk County at ferstfoundation.org.